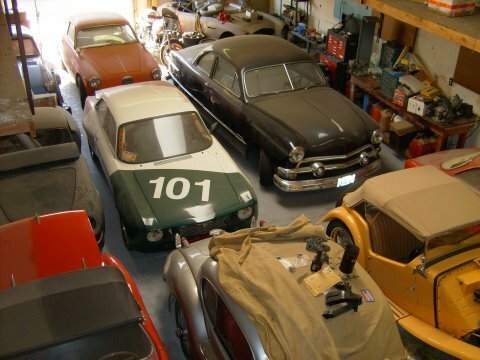 don’t you wish that you bought a big piece of land, and that out in the forest—-you found a garage that had this stuff? 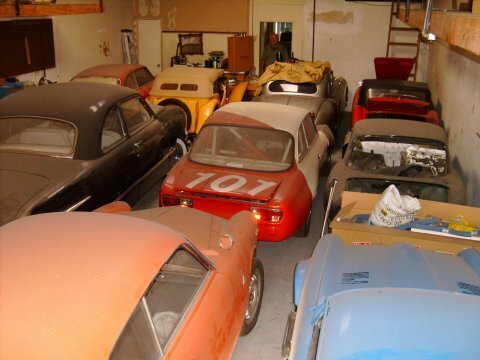 And NO, this is not that internet urban legend about the barn full of cars—-this is an actual barn, and these cars are all for sale. but most of all—-a gentleman. the world needs more people like Mr. Newman. I am a huge fan of Porsche Design stuff. Sure some would argue that it’s a bit cheesy and cliche to want things with a Porsche name—-and look like a bit of a fanboy if you don’t own one. I have driven Porsches and currently i drive an Audi—-a company which Porsche is currently in the process of buying! So technically i am not a fanboy. My next car will hopefully be a Porsche. So how am i preparing for my future Porsche ownership experience? The sunglasses i wear are made by Porsche Design and they are the ONLY sunglasses i’ve ever worn that didn’t break within 1 week. They are of impeccable quality. A few weeks ago i posted about a Porsche toaster that i want. If you’re ever used one of those ultra-slick Porsche design lighters, you’ll know the quality i’m talking about. 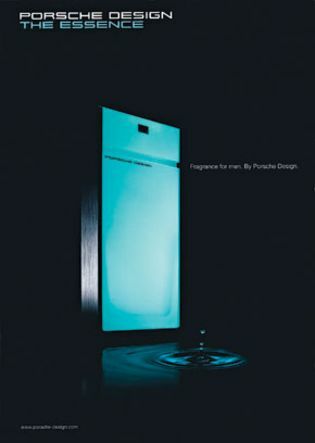 Now Porsche Design have introduced a fragrance! Yeah, so is it the smell of a 1972 Le Mans racing team? No, probably not. But the bottle is gorgeous, and the idea is fantastic. Sure there are other car companies who have launched fragrances—Ferrari (which isn’t half bad actually! ), Bugatti (which costs about as much as a Boxster), Lamborghini (haven’t tried it), Hummer (would never want to try it! ), and i think there is a fragrance called Ford Mustang (no thanks!) as well. The center of the new Porsche Design fragrance is a molecule they are calling “arctical”….i’m guessing it’s gonna be a bit cold then? i hope so. Further reviews in the next 2 or 3 weeks, after my wife brings me back a bottle from Duty Free. I own a Tag Heuer Monza, which i received as a wedding present a couple of years ago. It is an AMAZING watch—-i have been wearing it non-stop for the past two years. I still love it as much as when i first got it. It still looks brand new (well, aside from the slightly worn band), and it just excudes so much class, subtlety, and vintage racing sophistication—–all the way down to the little writing in the dial that says “MONZA”. Fantastic watch. I will love it forever! 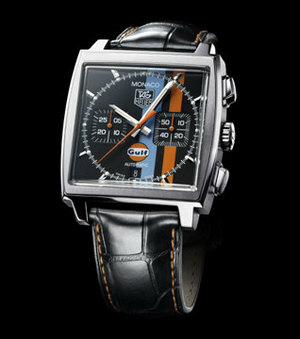 My dream watch costs about 3 times as much as this one—it’s another Tag Heuer, and it has racing stripes! 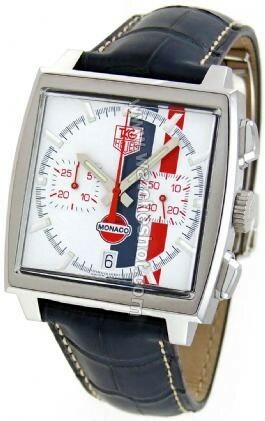 Tag Heuer released a limited edition Monaco watch in 2004 i believe—-with a white dial, red and blue racing stripes, and the Monaco logo in the center. 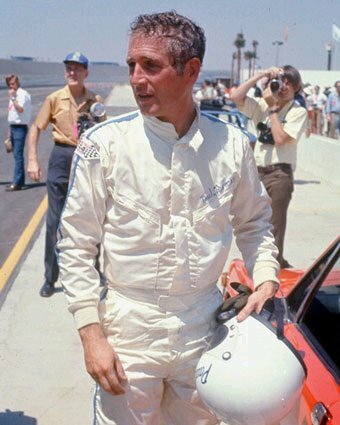 Then a couple years later, they released a black version with the gulf stripes and Gulf logo. the price? around $4000. But i want one—-OH i want one bad. 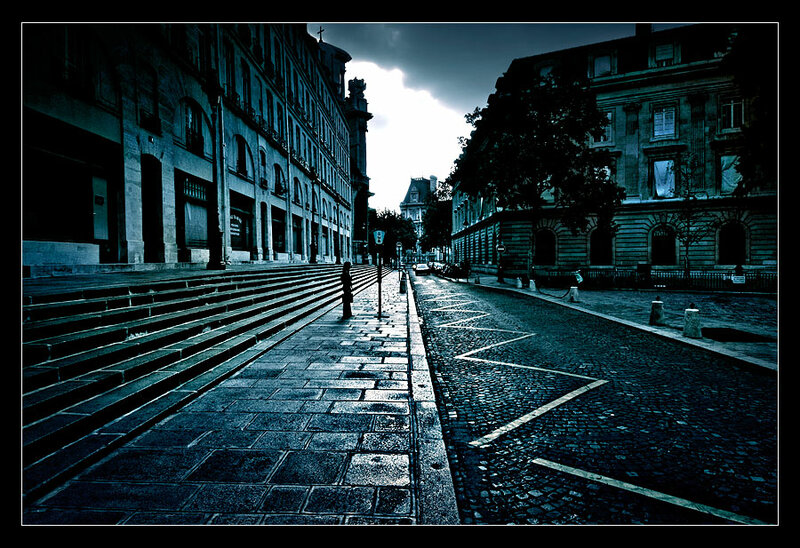 One day….one day. With all the technology, flair, and innovation on the side of today’s automotive engineers and designers—how is it that they cannot make classic designs anymore. Once in a while, you get a design like an Alfa Romeo Brera, Audi TT, Audi S5, or Mercedes-Benz CLS come into play. Cars which have character and verve. 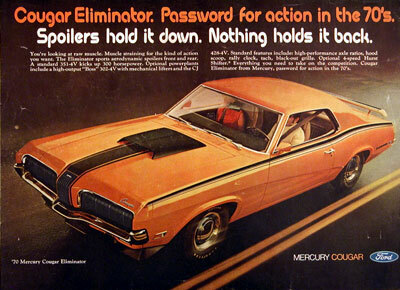 But in the 60s and early 70s, there were so many amazing designs which were thrown around. Point in example, one of THE most desirable cars in the world is the Porsche 911. It has been for 40 years now. Why? because it captures imagination, steers clear of in-the-moment design cliches—-and instead aims for a timelessness which is quite valuable and unwavering. 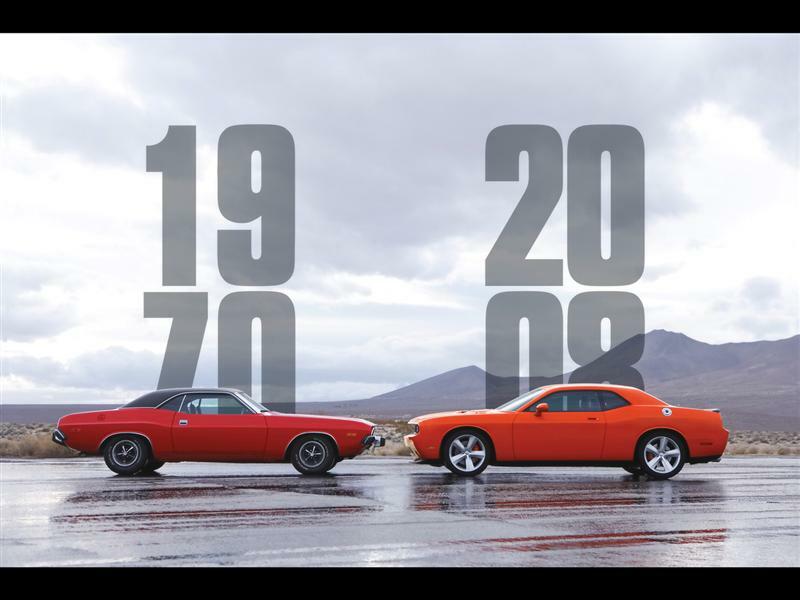 Dodge recently re-introduced a new version of the Challenger for 2009. 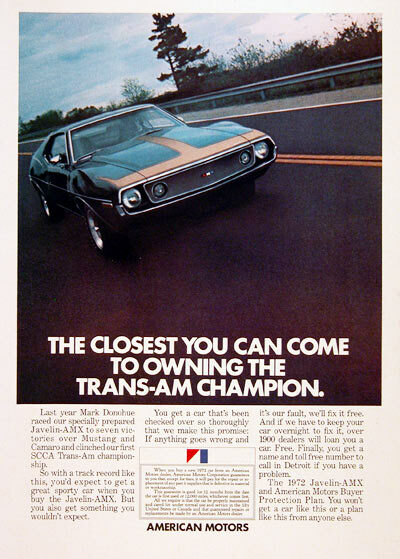 The original Challenger was a classic—in a time of cheap gas, muscle, and war. Right now, we have expensive gas, muscle, and war. The 2009 Dodge Challenger is a well designed car, albeit a bit contrived. I find it surreal that 30+ years after the original Challenger, you have a similar design looking back on the original. So is it really 1970 again? No, not really. 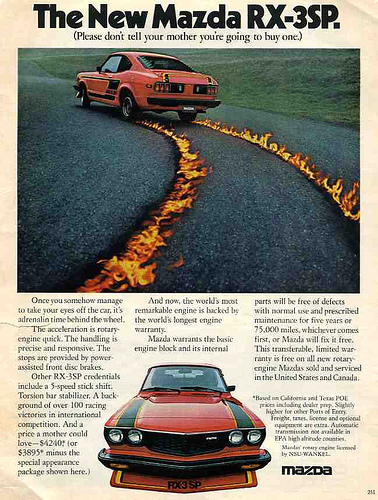 The original Challenger had CHARM—bucketloads of it. The new one does not have charm. The original Challenger was loud, raw, sloppy, and frankly a bit of a design mess—-BUT it came together in a way which felt organic and natural. The new one is perfectly molded, with stiff suspension, 20″ wheels, and organized body parts. look at the picture down below—-in fact there is NOT that much similar between the two cars at all. The charm of the original is gone! The new one evokes the old one in a slight, sort of alzheimer-ish memory problem type of way. So what is in the future of the state of cars? I’ll tell ya that CURVES ARE COMING BACK. They’ll be back in the next 5 years. We’ve had enough of the straight-edge-wannabe-modern-look. Curves are modern. Curves are timeless. 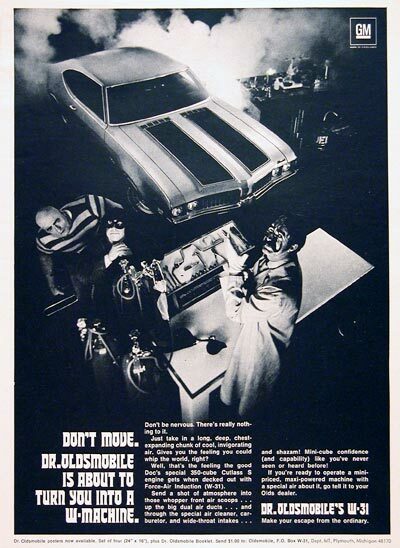 No one is gonna look back at the Cadillac CTS in 25 years and say—–“oooh that was a classic”! Oh, and Dodge should fix their new Challenger. Take out those demented 20″ wheels, and make it less ‘thick’ looking. when i was young, my father had a gigantic collection of national geographic magazines in the garage—in boxes. i must have been about 6 or 7 years old when i found these boxes. 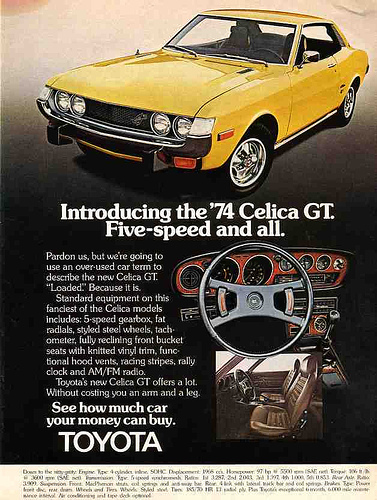 i used to look for african women showing their, erm, breasts—but mainly i used to look through them to see the amazing car ads they had. 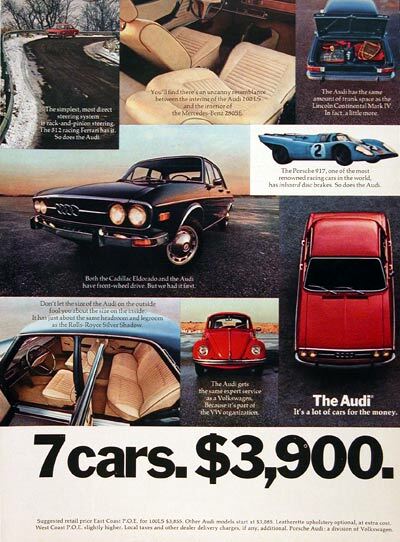 each magazine would contain at least 5 different cars in various spreads in the front cover, back cover, and in the middle as well. they were great! 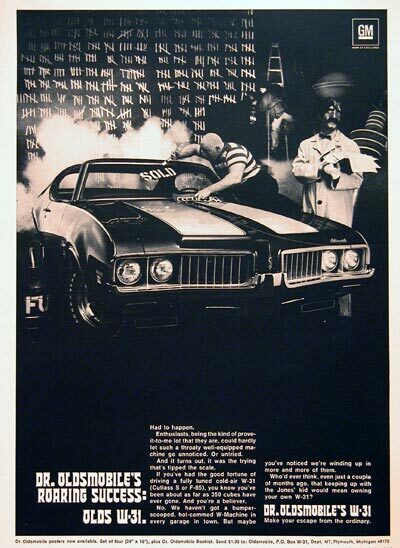 anytime i see 70s car ads now, i think of those national geographic magazines…. 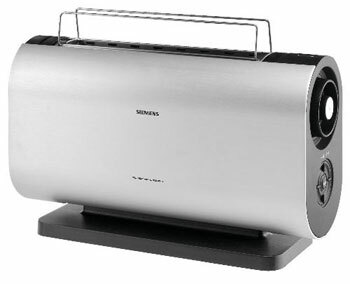 This toaster is in the future of my kitchen! check out some pretty cool T-shirts being made over at N138! news of the day: Cindy McCain = drifter? I was utterly shocked by the discovery that Cindy McCain, wife of US Presidential candidate John McCain (R) is a drift fanatic! Amazing how some people just surprise you….sure drifting is kinda lame, but not when you discover a 54 year-old first lady candidate does it! then it becomes just a bit cool i must say. Combine this with the fact that Obama drives a Toyota Prius (ugh!) and you really start to wonder which candidate would be better for cars……oh well, i’ll still support Obama—because at least we’ll be alive to drive. 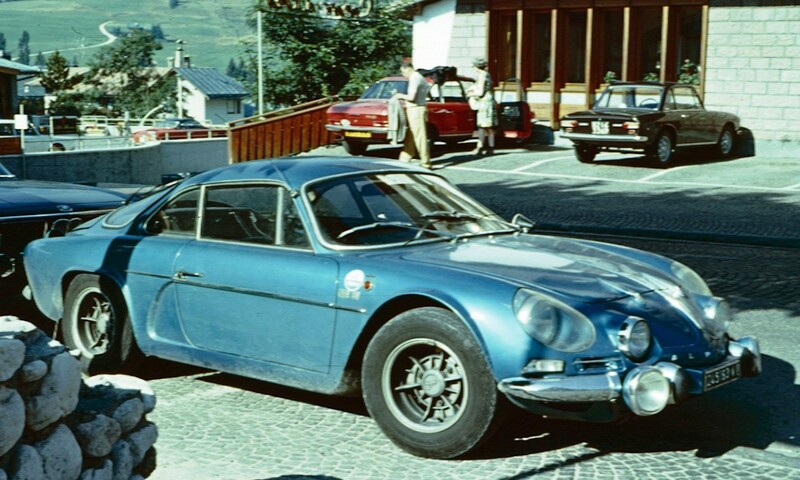 Renault Alpine A110. damn i want one. ah, to hell with it! 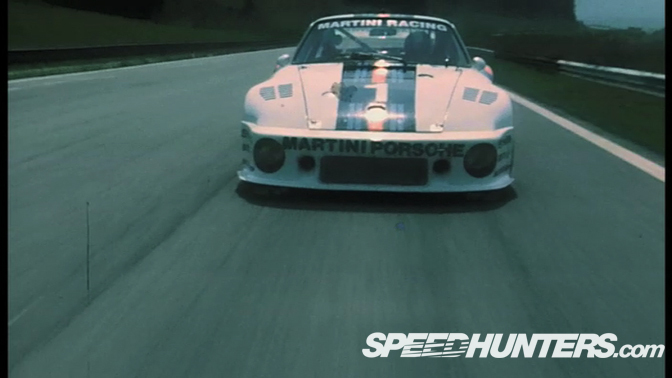 the ultimate sports car? lately i’ve gotten quite into fragrances—-especially ones that smell like leather OR petrol. this stuff is easy to find—properly easy. 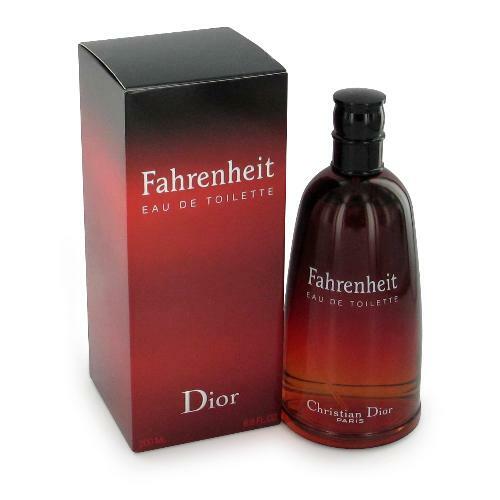 and it smells like you HAD proper cologne on, and then fell into a gasoline tanker. yes it smells like petrol….and yes it smells damn good. for those people who love to sniff their hands after filling up at the gas station…. this stuff is barely wearable, BUT i must give it credit for smelling like a 1971 Le Mans pit stop. 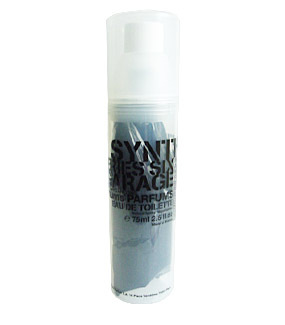 It literally smells like you rubbed your shirt into a vintage Le Mans race car’s oil pan, then soaked it in petrol, olive juice (from a dirty martini), and hung it out to dry in front of the exhaust of a trailer carrying your race car. really bold stuff, but very very unique. vintage racing souls use a miscellaneous feeling of pureness. a stripped down, raw, inner feeling that can’t be put into words so easily. i’ve heard various terms such as “petrolheads” or “car junkies” or “gearheads”—-all of them are rubbish. 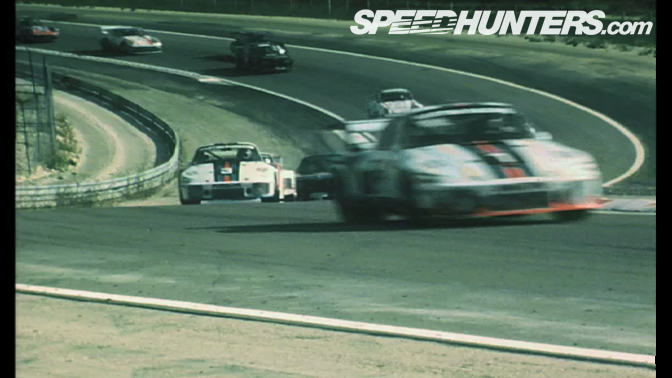 vintage racing souls are epitomized by a different context altogether. it’s not just about the cars—-it’s the ATMOSPHERE. a sense of belonging to speed, noise, smells, sights, style, and charisma of this world. an appreciation for the subtle and not-so-subtle uses of objects. in the end, cars will just be cars—–but the experience of them will be inside YOU. what is gonna make your calender move day after day after day after day—-the experience of living, brought forth via dreaming, and honoured by living the idea. this is not about old cars, old times, history, or nostalgia. THIS IS ABOUT NOW, IN A MODERN WORLD, WITH EYES ON CLASSIC APPEAL. there were cars, ideas, soul, feel, and everything in between. in the looks, in the lifestyle, in the dreams of young boys who turn into young men and carry their world into the years. IEDEI will bring together ideas, items, and thoughts which breathe through the insides of vintage souls like you and i. stuff you should buy, places you should go, things you should know, ideas you should feel.